This release in Harmonia Mundi’s budget Musique d’Abord line is a reissue of a discontinued disc from 2004. Continuing interest in the music is understandable, for these composers of the Spanish Baroque, with the exception of Juan Bautista Cabanilles, remain almost unknown for general listeners outside the Iberian sphere. Conductor Eduardo López Banzo, a student of Gustav Leonhardt, is unapologetic about presenting a selection of worthwhile compositions rather than trying to bring together, as he puts it, „works of a doubtful level of quality chosen only because they might have been performed on this or that memorable occasion in the past.“ There is no need to make such a questionable categorical statement, but in this case the position is justifiable: the first order of business for many listeners will be to get the lay of the compositional land. And, from the evidence here, Banzo is right to champion this music. The vocal pieces reflect Italian styles but nevertheless have a characteristically Spanish quality that is hard to pin down but is always there. There are double-choir effects (sung here with one voice per part), more often worked into another kind of piece than serving as the primary structural principle. There are conservative polyphonic pieces with instrumental accompaniment such as Carlos Patiño’s motet In devotione (track 1), with a grand air somewhat resembling the French motets of the later 17th century. The Cabanilles tientos (referred to as organ works in the booklet although performed here by a small ensemble) are monuments of learned yet brooding polyphony. And most interesting of all are the villancicos, a genre familiar to those who have explored Spanish music in the Americas. They are vivid, often comic sacred works in the vernacular Spanish, and they were plenty controversial in their own time. This release is hampered by the lack of printed texts in the booklet; even Spanish speakers are going to have a hard time with the villancico texts. But the album saves the best for almost last: the large Lamentación primera, del Miércoles, of Sebastián Durón, is something of a lost masterpiece. Probably not quite like anything you’ve heard before, it is a polyphonic piece based on a descending four-note figure with dissonant, declamatory solo interruptions that are derived from the same figure. It’s stately, emotionally powerful, and rigorous, all at the same time. 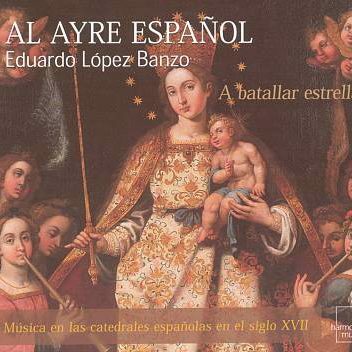 The singers and players of Banzo’s group Al Ayre Español have a smooth, precise sound appropriate to the elevated status of the music, although the villancicos could use a bit more vim. On balance, this is a reasonable place to start in exploring this fascinating and varied music.